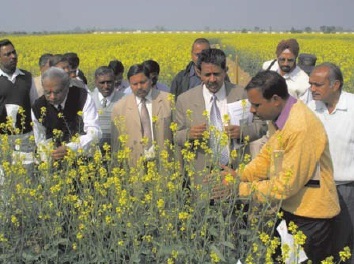 Indian Council of Agricultural Research (ICAR) established the National Research Centre on Rapeseed-Mustard (NRCRM) on October 20, 1993 in Sevar (Bharatpur) and redesignated it as the Directorate of Rapeseed-Mustard. NRCRM also has under its umbrella, All India Coordinated Research Project on Rapeseed-Mustard with 22 research and 11 verification centres across the country. NRCRM provides training and help for Breeding methods and varietal improvement in rapeseedmustard, Hybrid development in rapeseed-mustard..